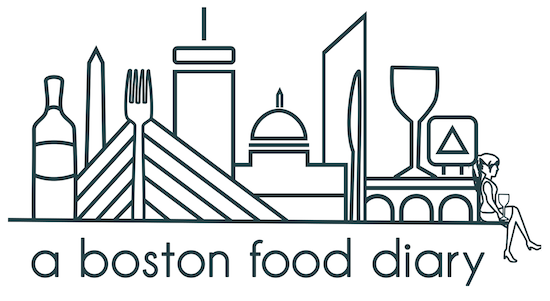 A Boston Food Diary: Pasta and Meatballs-the ultimate cold weather food! Pasta and Meatballs-the ultimate cold weather food! The past few days in Boston have been brutally cold-so cold that the ice that forms overnight doesn’t defrost during the day. It’s so cold that even my warmest sweaters don’t feel warm enough. It is certifiably frigid out there. So what does frigid mean? It means warming, comforting foods-the type of food that says “Hey! You there-come on inside, close the door and don’t even think about leaving again til it warms up 20 degrees or so”-yeah, that’s the type of food I’m looking for. So I made some. Sunday afternoon, with no football to watch, no place to go, we hunkered down and I made meatballs, with fresh homemade tomato sauce. There is something about tomato sauce that I just adore. I think it’s partially how versatile it is. Tomato sauce can take on so many different forms- from rustic with big chunks of tomato and simple seasonings, to much more involved creations blending smoother textures, different types of alcohol, spices, and herbs. Making tomato sauce from scratch is purely therapeutic for the simple fact that it allows your creativity to flow and explore. the package left over. 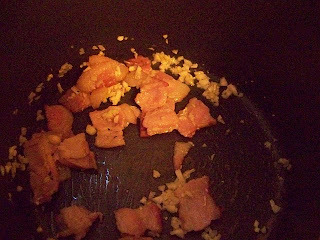 What to do with half a package of bacon? There are many, many ways to answer that question but I decided to brown three slices, cut into small pieces, and have that be the base of my tomato sauce. I am a big believer in baking bacon. Its easier, cleaner, and faster-place your strips on a baking sheet lined with tinfoil for easy clean up, pop them into a 400 degree pre heated oven, and let ‘em cook for about 10 minutes (depending on thickness of cut, and varying ovens) they come out crispy, and delicious. They also leave behind a lot of their grease on the baking sheet. 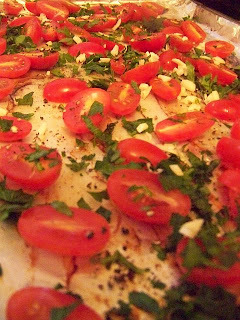 Hmmm bacon grease… I decided that it shouldn’t go to waste and so I sliced plum tomatoes in half, spread them out on the same bacon dripping pan, topped with finely chopped garlic, parsley, and basil, salt and pepper. Back into the 400 degree oven til they started to blister. While the bacon grease was working its magic in the oven, I had it working up on the stove as well. Once the small pieces had started released a fair amount of juice in the bottom of my stock pot, I started to add chopped garlic and chopped onion to the mix. As those started to turn translucent, I added fresh ground black pepper, and a few shakes of crushed red pepper flakes to the mix. 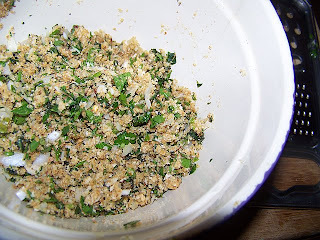 Finally, once everything in the pot seemed to be coming together into a very fragrant mix, I added in a few handfuls of chopped parsley and basil to the mix. 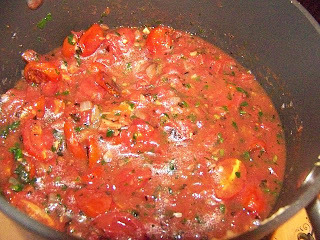 Then I added in three cans of stewed Muir Glen tomatoes because I just love the texture that they give to sauce. This summer though-when local tomatoes are wonderful I plan to can my own. We’ll see how that goes. The final step- those lovely roasted cherry tomatoes-with all of their delicious flavor were added to the pot with everything else. Then it was time to sit back and relax for a while as I let the combination of flavors blend over low heat. 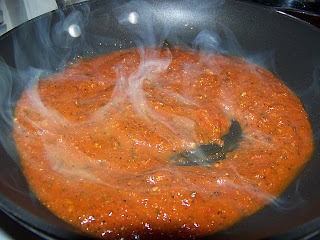 About an hour or two later (time flies when you’re playing the Wii), after stirring the pot at varying times, I pulled out my trusty immersion blender, and pureed the tomato sauce into a smooth, fragrant, wonderful pot of deliciousness. I have to say-I was completely amazed by the work of the blender. Past uses have been a bit frustrating- but Sunday afternoon-it was a dream! I put the pot of soup back over very low heat, and began work on the meat balls. baking meatballs is that they tend to dispense a lot of the grease that they have from the meat, and they don’t absorb any more as they would in pan frying. Additionally-they are much more hands off. 20 minutes later or so, I removed some very nicely browned meatballs from the oven and placed them into the sauce pot to further mingle the flavors. When it was time to eat, I heated my pasta water, boiled the pasta til nicely al dente, ladled some of the sauce into a fry pan, and then transferred the pasta into the meatball free pan of sauce to coat it. 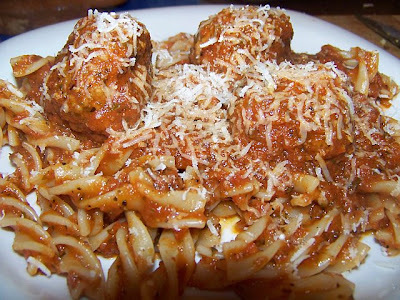 A quick plating of helpings of pasta, a couple of meatballs, and a fresh grate of Parmesan cheese and dinner was served! What a wonderful, hearty and comforting meal on such a cold night! The sauce had great flavor and body to it. The smokiness from the bacon didn’t overpower the other flavors, but more maintained a nice background to the dish. There was a slight kick to it from the red pepper flakes, the herbs kept their unique flavors, and even the pepper was present. 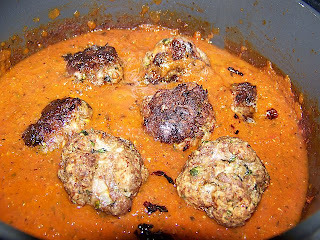 The meatballs were also quite tasty-they added nice texture to the dish, and while they maintained the delicious flavors of the sauce, they also added their own with the great combination of beef and pork, along with their smattering of Parmesan cheese. This brought me right back to my mother’s kitchen on cold winter nights- the perfect place to warm up.